SAN CARLOS – It’s a chilly Friday morning on highway AZ-170 on the San Carlos Apache Indian Reservation. Thick clouds fill the sky, with slivers of sunshine breaking through here and there. Outside of the tribal administration building, someone shouts a 15-minute warning before march time. People pack up their gear, stop by the restroom, and grab what’s left of the fresh fruit and other snacks left out on a long picnic table. More than 75 mining opponents flocked to San Carlos to protest mining they believe could destroy sacred Apache land known as Oak Flat. 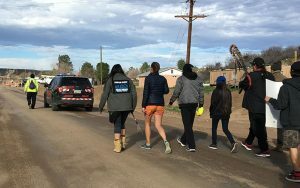 Protesters walked 40 miles in two days in February, starting on the reservation’s main road and ending at the Oak Flat campgrounds. The mission: bring awareness to the longstanding tensions between the economics of mining and the preservation of the environment. Advocates for preservation reflect on an area rich in beauty. Avid hikers, campers, and nature enthusiasts flock to the mountains for climbing, camping, and sightseeing. Oak Flat is the “last pristine area. They are now attacking it,” said marcher Anna Jeffrey, who has spent her life in Superior, which she calls the backyard to Oak Flat. Advocates for mining call Oak Flat rich in copper and jobs potential. The battle over Oak Flat lies 7,000 feet underground, in copper threaded through Arizona’s economic history and future. Resolution Copper Mining produces copper from mines around the Superior area. The company, Arizona congressional members and mining industry advocates support mining there, saying Oak Flat is ideal for mining. It wants to “develop one of the world’s largest untapped deposits of copper,” according to its website. A 2015 economic-impact study from the Arizona Mining Association says copper mining accounted for more than 50,000 jobs in 2014. The economic impact reaches $4.8 billion, the study says. “Sixty-eight percent of all the copper produced in the U.S. comes from Arizona,” according to the Resolution Copper website. The initial scoping of the Oak Flat area is done. Now the U.S. Forest Service is analyzing and resolving issues found in the scoping process, according to a 2016 status update on the Resolution Copper website. Republican Senators McCain and Jeff Flake supported the federal agreement in 2014 allowing copper companies more than 2,000 acres to mine, including federally owned land such as Oak Flat. Neither McCain nor Flake returned calls for comment about the February march. Apache tribal leaders and other preservation advocates say Oak Flat is sacred space that deserves protection and is another example of native lands under assault. “The land has been desecrated so much…nature is trying to warn us that, if we continue, we’re really gonna hurt ourselves and the future generations,” said Nicole Nells, a member of the Apache tribe. 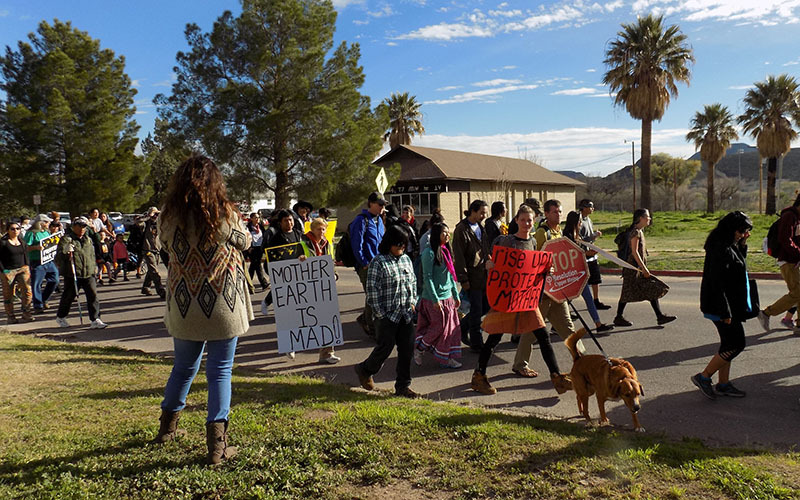 Nells marched toward Oak Flat because “destructive forces have destroyed so much already we should do what we can now before it is too late.” Nells joined protesters who also fear the impact on the environment. Protesters approached the 40-mile march as a pilgrimage. The more people know about Oak Flat, the more people will talk about it and people are more likely to stop it, advocates said. “I pray everyday that people will wake up and see the devastation that this mine would bring and stand with us and stop it,” said Jeffery. She went on to say that the people in power are only thinking about the money they can get today but not what will happen to the land and the people in the future. The march has ended but the fight is not over, advocates said. Since the protest Jeffery has resumed avidly hiking through Oak Flat. She said the march was successful in creating more awareness about the controversy. “The awareness is like an awakening, manifested by reality and truth of what has been happening to our precious earth for centuries,” said Jeffery, who said she will write letters to Congress to keep up the fight. Correction: A previous version of this story said Oak Flat is on tribal land. The federal government owns the land.